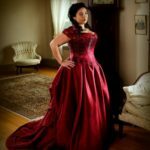 Deep and intoxicating, this corset gown provides dangerous curves with a brocade corset and matching brocade skirt. 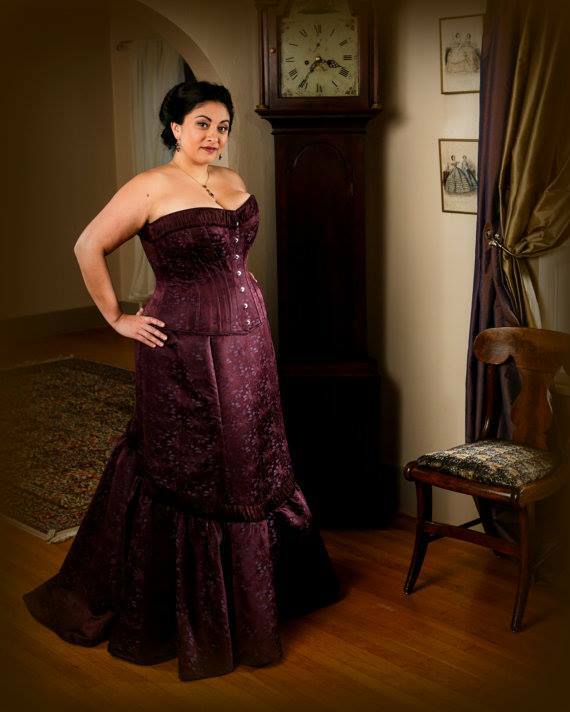 The corset is made of deep plum colored brocade detailed with eggplant colored hand rouched trim along the top. The front panels allow a generous fullness in the bust and hips while the waist is nipped in. Based on a classic Victorian shape, this style accentuates extreme curves while smoothing and lifting. The back is laced with black satin ribbons for added adjustablility. For the convenience of donning the corset by yourself we have included a center front opening spoon busk closure. The spoon busk is made of steel and and shaped to give the wearer extra control holding in the waist and tummy area providing even more shaping and smoothing. The shapely skirt is made of the same eggplant brocade with coordinating rouched trim above the bottom flounce. This style of skirt is made of five-gores with darts creating shaping over the hips, flaring at the hem with a bias cut flounce. It features an adjustable waistband and a slight train at the back for dramatic effect. 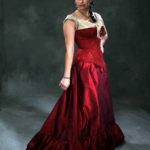 Palatine Bridal division of Period Corsets offers exquisite gowns and corsets exclusively for curvy, plus-sized women.